A powerful talk by Damilola Taylor’s father, Richard, on the tragic consequences of knife crime was part of a hard-hitting awareness week held at Uxbridge College in response to the Mayor of London’s London Needs You Alive campaign. Richard began campaigning to combat violence among young people after his ten year old son was tragically killed in Peckham in 2000. 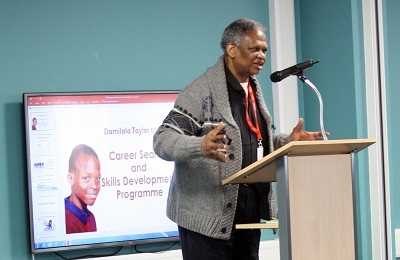 He spoke to students about the personal and community impact of Damilola’s untimely death. 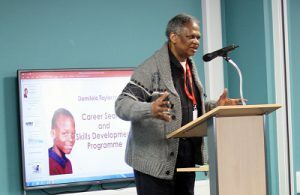 Richard’s charity,the Damilola Taylor Trust, is committed to supporting young people to lead safe and healthy lives and to reach high to fulfil their potential. A donation was made to the charity through student fundraising. Richard’s talk was attended by around 500 students, with another 1,000 watching on live stream. The event was one of a number held during the awareness week at the College, which also included a first aid workshop from the charity StreetDoctors and a range of workshops, exhibitions and tutorials. The week was inspired by Sadiq Khan’s campaign to educate young people about the risks of knife crime. Liam Plumridge, course Team Leader for Employability, Progress and Review, who organised the event as part of his work supporting tutorials and student development activities, said: The series of events gave our students an important insight into what are, unfortunately, becoming increasingly serious issues for all young people, not just in London but all over the country and worldwide. It is a top priority at Uxbridge College to do everything we can to help our students stay safe and make well-informed decisions in every area of their lives; I have no doubt that this week of events will support them in doing so.